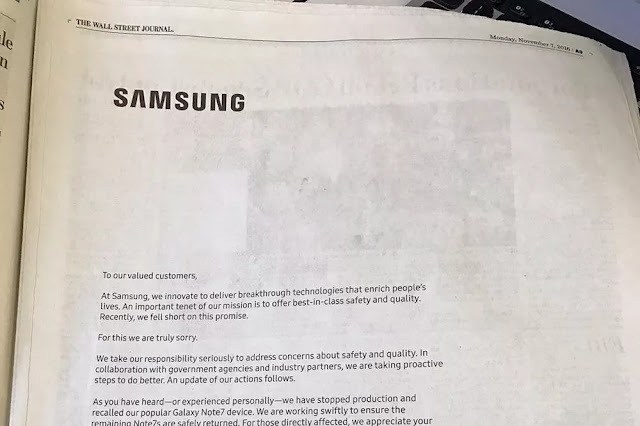 On Monday, the Korean hardware giant issued an apology to its customers in the form of a full-page ad in The Wall Street Journal, The Washington Post, and The New York Times. The letter comes nearly a month after Samsung’s second, and final global recall of the Galaxy Note 7. In September, after reports of explosions first surfaced, Samsung recalled the Note 7 and started to issue replacements. After the replacements also started to explode, Samsung decided to end production of the Note 7 altogether.